Emotional turmoil is frequently cited as the most unexpectedly difficult aspect of dealing with a divorce. Whether you buy into the whole, “men are from Mars, women are from Venus” spiel or not, it has been well-documented that men and women deal with the psychological aspects of separating very differently. Women are generally more vocal and outspoken about their emotions, which leads them to seek support and can speed recovery. On the other hand, men tend to take the divorce much harder and face a more difficult time dealing with the emotional aspect of a break up. Many reasons contribute to these differences, but men need to realize that as uncomfortable as they may feel asking for help, taking care of your mental health is vital to a healthy breakup and moving on. Women initiate divorce twice as often as men, which suggests women have noticed that problems exist for a longer period of time and feel more of a sense of relief when the divorce finally happens — they are actually able to begin getting over the divorce before papers have even been filed. Having a support system, whether it is friends, family or professionals, is vital to maintaining a healthy mental state. 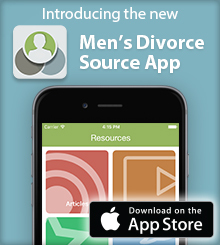 For a lot of men, the divorce may come as a complete shock to the system. Perhaps they noticed little things here and there, but nothing so severe that it would require divorce. Men are hit hardest by the abrupt change in lifestyle, routine, finances, and the loss companionship; very likely, the one person they trusted to support them in times of need. These problems are exemplified when children are involved. Men frequently get the short end of the stick when it comes to custody, since the courts generally side with the mother as the more suitable parent. Losing out on so much time with their kids can be particularly devastating, and custody battles, even temporary ones, are often like pouring salt on an open wound. At the same time, men are usually more inclined to try dealing with their problems on their own rather than seek professional or even social support, which puts them at a disadvantage when it comes to healing from the emotional wreckage of divorce. They frequently try to find distractions instead of dealing with their feelings head on, such as over-working, jumping into new (and often unhealthy) relationships or turning to alcohol. While these methods might help dull the pain short-term, it will still be there when you wake up in the morning and you will be much slower to move on than if you faced your problems. It also helps lead to a much higher rate of depression and suicidal tendencies among divorced men than divorced women, so understand that your go-to coping mechanisms likely will not work for such a severe problem. All of this can lead to an oppressive feeling of being stuck in a situation where you can’t see a clear way out. As cliché as it sounds, the first step in getting out of this rut is to accept your current situation and to avoid letting your mind distort things out of context. When men try to handle the emotional strain of divorce on their own, it leads to drastically increased levels of stress, depression and suicidal thoughts. One of the most important things you want to avoid is becoming entirely reclusive. It is often reactionary to seek isolation when you are dealing with something incredibly painful, but putting yourself in social settings will help keep you from dwelling on your problems and get you back into a sense of normalcy. It can also help you find a new means of support. Relationships often devolve into a couple relying solely upon one another for emotional comfort, and now that you are divorced, you must seek a new system you can trust. Whether this is a close friend you can vent to, family that you don’t feel ashamed to let see your hurt, a professional therapist you can rely on for confidentiality or, ideally, a combination of all, divorce is not a situation you should try to deal with alone. Only once you have a basic control and understanding of your emotions can you truly start to move on with your life. It does not make you a sissy to admit you are hurt by divorce — everyone feels devastated — but that attitude can serve to lengthen the healing process and make you far worse off in the long run.